This short 1-kilometre walk brings you to not one but two viewpoints - over the Garhwal Himalaya and over the Doon valley. If you thought Lal Tibba near Mussoorie has the best Himalayan views, you've probably never been here at sunrise. The Greater Himalayan peaks are best seen from sunup to noon, especially on a clear day after rains. If you are in Mussoorie especially after a rain shower, you owe it to yourself to walk to this knoll at sunrise. Garhwal Himalayas including Bandarpunch massif and Gangotri group, visible from George Everest House, Mussoorie. George Everest House or Park House has an interesting history, just like its owner. Built in 1832, the house is known today as Sir George Everest's House and Laboratory, or Park House. The house is situated in Park Estate, about 6 kilometres west of Library Bazaar (the west end of Mall Road in Mussoorie). Sir Everest purchased Everest Park in 1833 from General Whish. He owned the house for about 11 years till he returned to England in 1843 where he got married. Old Mussoorie citizens still maintain that the "bibikhana" on the property was not ornamental! The bibikhana has since then been knocked down. The deep cisterns near the front yard of the house have survived. Despite claims that these deep cisterns were pits for ice storage, I believe these were water cisterns, since this end of Mussoorie ridge is notoriously water deficient. Even villages as far as Dudhli, that supply most of Mussoorie's milk, ferry water from one water source. Today Park House (Google Maps) falls under the Tourism Department's purvey. The once white house (in March 2016) is sprayed liberally with names, declarations of love, cuss words and graffiti. The Tourism Department's response was to bar every door and window in the house with thick iron bars, apparently to keep people and cattle out. In their wisdom, the department has also covered a few interior walls with ceramic tiles. Sigh! Thus, Park House today resembles a maximum security prison rather than an important historical landmark. Nonetheless, if you peek inside through these bars, you can still catch a glimpse of robust wooden ceiling beams and ginormous fireplaces. One can only imagine what it would be like if restored and comfortably furnished. 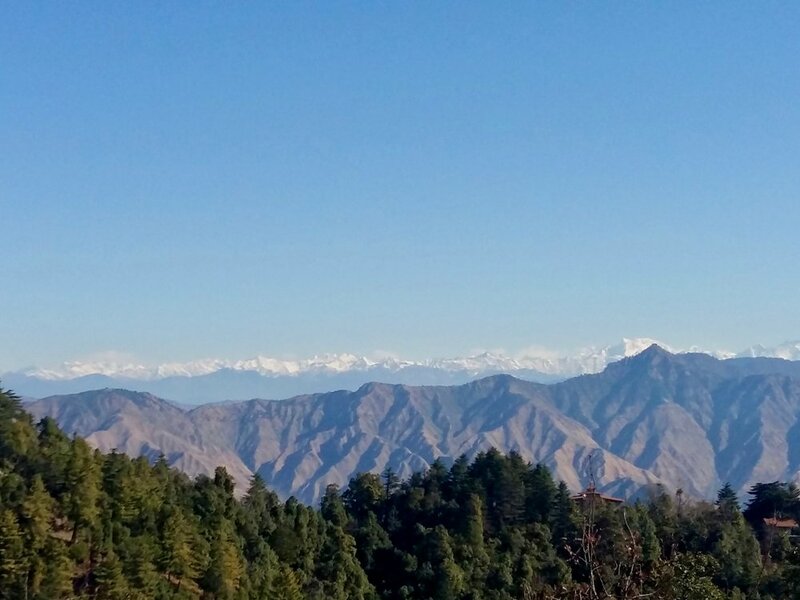 George Everest knew his topography; to the Southwest are fantastic views of the Doon Valley and to the Northeast are spectacular views of the snows with Mussoorie in the foreground. Sunset over Doon Valley from Park House © Bharat Singh Bhadwal. All rights reserved. The knoll that overlooks Everest house is also known as "Tibetan Hill" because it houses hundreds of Tibetan prayer flags. The knoll has two "stumps", each of which resembles an elephant's foot. These elephant feet or "Hathipaon" are your best viewpoint to gaze at the Greater Himalayan peaks as they tower over the Nag Tibba range. 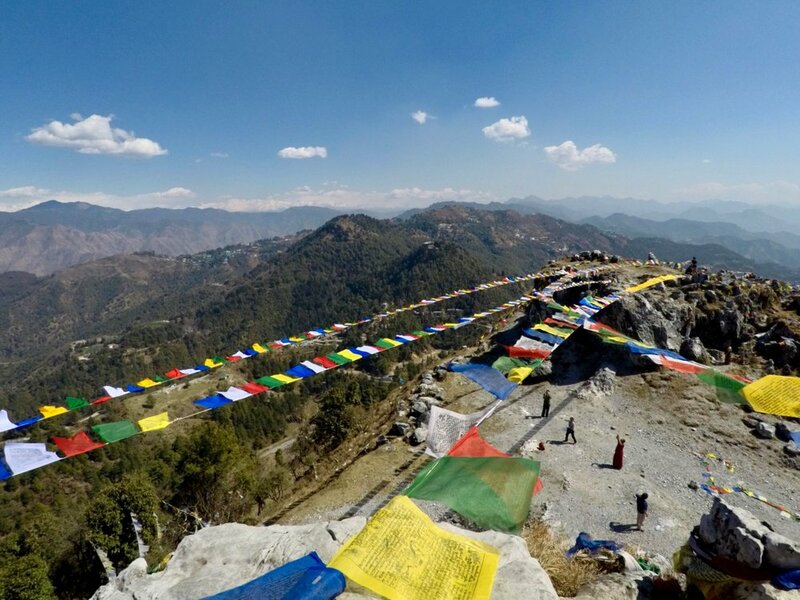 Every year on an auspicious day, people of Tibetan descent come up to the hill top to replace the old prayer flags. This year I had the pleasure of meeting two gentlemen who had come up to put new prayer flags. We were the first ones on the knoll at 0730 and we sat sharing a cup of hot chocolate while watching the Garhwal Himalaya materialise from the mist in the North. I found out that one of them Tsering Dorje was a monk from Kibber village in Spiti, Himachal Pradesh. Over our conversation, we decided to do a bit more than bemoan the state of garbage at Hathipaon. We made a huge pile of discarded plastic water bottles and leftover wrappers. Over the next hour or so the pile got so large that it got impossible to lug it down to Mussoorie. So, we decided to set it alight before we started to burn the old Tibetan prayer flags. Not my favourite way of garbage disposal, but we reckoned it was better than doing nothing. Tibetan tradition considers prayer flags to be holy. Because they contain sacred texts and symbols, they should be treated respectfully. They should not be placed on the ground or put in the trash. When disposing old prayer flags, the traditional way is to burn them, so that the smoke may carry their blessings to the heavens. Over the day a lot of Tibetans made their way up the hill and amidst much revelry, music and chanting, new prayer flags were set up on the Tibetan Hill. Prayer flags go up around the two "knolls". These knolls are the perfect place for Garhwal Himalaya gazing. There are numerous ways to get on top of the "Tibetan Hill". 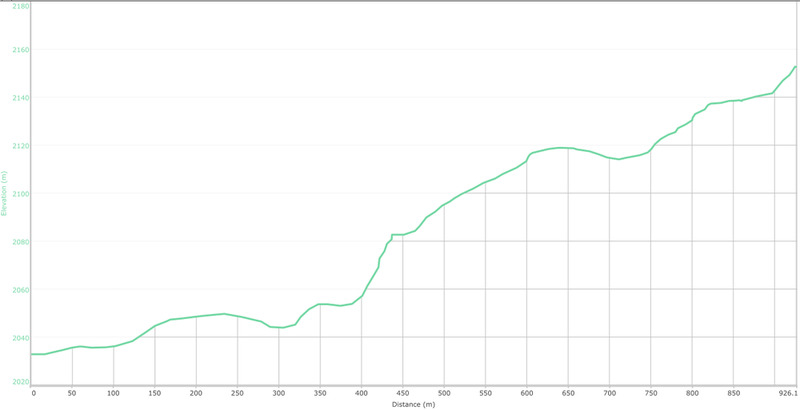 The route described here (see GPS logs) is the safest. Yet despite this being the safest route, we will not go as far to call it a child-friendly trek. there are a couple of sections that are exposed on one side and the terrain is gravel and scree which does not afford second chances. Even if this is the safest route, exercise caution, wear the right footwear and do not get carried away by the seemingly huge number of people who have already made it to the top. Dehradun lights from knoll 1. In George Everest's days this city must be all forest. Why do this walk? For the best sunrise views over Greater Himalayas and the best sunset views over Doon Valley. Just under one kilometre. Yet, the route has a couple of narrow unprotected sections that require care. Its not a child-friendly trail for this reason. It's worth being at the knoll at sunrise and sunset, however, if you do plan to stay late make sure you have a headlight (or a torch) for descent and steer clear of people who come up this knoll to get drunk. George Everest House has a couple of tea shops (Google Maps). You can get a packed meal to enjoy on the Tibetan Hill. If you do decide to have a picnic meal, we urge you to bring back all that you carry. Winter Line Adventure Camp (Google Maps) provides tents and accommodation close to Park Estate. It charges Rs. 1500 for a double bed tent with attached toilet during the off season. It also allows you to set up your own tent for a fee.